Total revolutionary way to modify your Shovelhead. Stop spending hour welding and machining the old box and then manufacturing all the parts. The Shovelhead is one of the coolest looking motors ever produced and splitting the rocker box makes it look that much cooler. It is available in raw, polished and chrome. This kit also includes the matching oil line kit. · Fits all 68-84 Shovelhead motors and all aftermarket motors using the same type of rocker box. 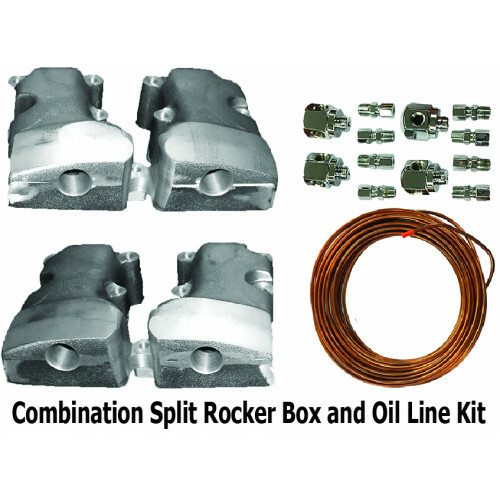 · Exterior copper oil line it with machined rocker shaft nuts are sold separately, in case another top end oil line feeds is planned. · Can be used with the S&S ® hydraulic lifter update kit P/N 496617 and a Evolution cam, to all the top end through the pushrods. This product is also available at Bikers Choice on page 1054 of their catalog.